One of the greatest natural wonders of the world is the Great Barrier Reef located off the northeastern coast of Australia and bordering the crystal clear Coral Sea. It is the world’s largest coral reef system, extending about 2,010 kilometers (1,250 miles) parallel to the coast of the state of Queensland. The reef is a foremost tourist attraction bringing in about 1.6 million tourists a year. Cairns is one of the largest centers for reef tourism as well as a few secluded islands located farther offshore. 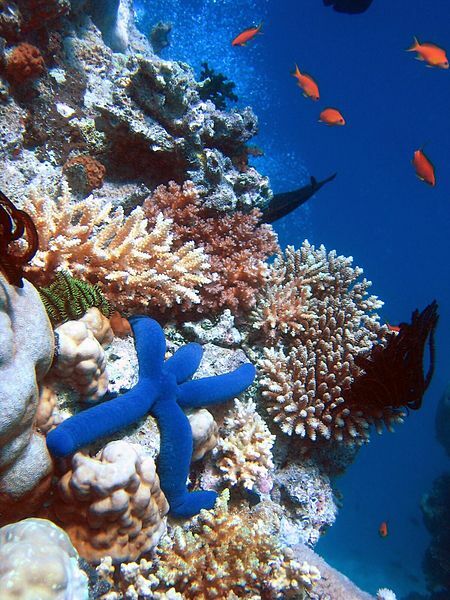 The Great Barrier Reef is about 500,000 years old, with its most recent growth starting about 8000 years ago. Coral reefs begin to build where large numbers of stony corals live together and skeletonise Together with sand, rubble, plants, and mollusks form a limestone foundation. Layer by layer it builds over thousands of years. Nearly 3,000 individual coral reefs and about 300 small coral islands called cays form the reef, which makes it the world’s largest structure made by living organisms. It may be surprising to some that corals are living animals, as they were long thought to be plants. They have an opening or a mouth to take in nourishment, require shallow waters for oxygen intake and are very easily broken when collided with by foot or object. White coral is in fact dead, but the bright, almost neon coral, a dazzling site whether beheld from above or beneath the sea’s surface, is very much alive and changes in colour with the water, which ranges from brilliant blue to aqua green. These coral gardens along with underwater canyons, shipwrecks and marine animals make snorkeling and scuba-diving the most popular activities on the reef.